Try Vendio Gallery Risk FREE! Pictures are enlarged to show detail. Please refer to the description below for the actual size. Pictures are taken under natural white light but please understand that the colors may be slightly different on different computers. Thank you for coming in! 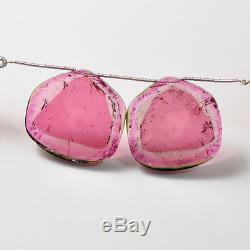 Absolutely stunning rare super HUGE watermelon tourmaline slices! These specimens have unique triangular rubellite pink cores and pink shells, simply precious! 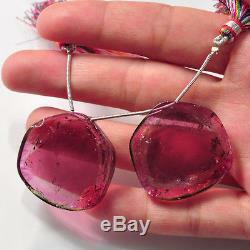 2 stunning large watermelon bead focals! Photos show both sides of the beads. You'll get the pair you see! SIZE: 31mmx32mm to 31mmx31.7mm. Please request an invoice from us if the total seem to be not right. Add a map to your own listings. 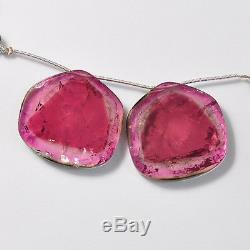 The item "108CT Rare Large Watermelon Tourmaline Slice Briolette Beads PAIR" is in sale since Wednesday, October 12, 2011. This item is in the category "Jewelry & Watches\Loose Beads\Stone". The seller is "vivienwill" and is located in Vista, California. This item can be shipped worldwide.